Sunday, the last lap, day three of three. The previous day's events culminating in the Managers Big Band retaining its senior open title were still fresh in the mind. Now it was over to the coming generation to show what it was capable of. Two competition sections - schools and youth - offered a full day's entertainment at Park View Community Centre. Durham County Cricket Club aside, there can be few occasions in the calendar when hundreds of people descend on Chester le Street to participate in a truly social gathering. The overcast conditions threatened rain, the kind of conditions a seam bowler would relish down the road at the Riverside. At this time of year, it's either indoor nets or a warm weather training camp. That's for the cricketers, here at Park View conditions were ideal for big band jazz - a large, well-lit stage, a cabaret-style seating arrangement, a real ale bar, food, stalls - in short, a festival which ticked all the boxes. The Johnston Stompers (MD Lucy Wiggers) arrived in school uniform, perhaps the only band to do so this year. The Stompers were representing Durham Johnston School. First-time participants, their programme comprised three numbers - Malaguena, Summertime and, refreshingly, Tiger Rag. One or two short in some sections, the local representatives gave a good account of themselves. 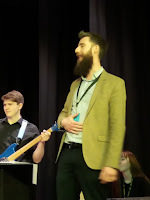 The Tyne Valley Jazz Ensemble (MD Dave Hignett) tends not to have a problem recruiting musicians, indeed it would come as no surprise to learn there is a waiting list! Sophie Speed is a talented member of the saxophone section and Dave Hignett ensured she was given every opportunity to shine and shine she did! TVBB gave value for money fitting in five numbers; Buffalo Head, Gospel, the welcome inclusion of Basin Street Blues, Gimme Some Lovin' (minus the Hammond B-3) and Lady Madonna. Greenhead College Big Band (MD Nick Dolling) from Huddersfield featured an instantly popular vocalist - Ms Daisy Cameron. Diamonds Are a Girl's Best Friend sang Daisy, Lullaby of Broadway and Mambo from West Side Story were staple fayre either side of a world premiere piece - Last Dance - composed by band pianist Louis Enright. The reigning champions Burton Borough School Big Band (MD Alison Ruston) made the long journey from Shropshire no doubt determined to mount a stout defence of their title. Sam Jones' Unit 7 opened the programme. This was impressive! A big band fan said: “Frightening, isn't it?” He was referring to the exceptionally high standard and it continued with Life Long Friend (a trombone feature for Ed Simons), Joe Zawinul's Mercy, Mercy, Mercy and Soul Sacrifice from an early incarnation of the Santana band. Our big band fan confided: That's it. Well, not quite it. Yarm School Big Band (MD Chris Hibbard - pictured) wanted to have a say and so they did. The hirsute Hibbard, of Crooners' fame, put his young charges through their paces with solid contributions from Femi Afolabi, tenor sax, on I Concentrate on You and James Muir, alto sax, on the band's final number Swingin' Shepherd Blues. * The section consisted of one trombonist - Harry Coe!